My fixation with egg salad started when I was just a little girl. My family would go on long road trips (say, to the mountains up north, or to the seaside) and my mom would prepare a variety of sandwiches for the ride. The egg salad was my favorite. I remember savoring each small square (she would slice each sandwich into two), biting a bit at a time, chewing slowly, pausing between bites, attempting to make it last as long as possible. My mom would pack a lot, but I dared not eat too many for fear I would receive one of those stern looks she reserved for when I overstepped my food boundaries (ah, childhood food issues…let’s not traverse that dark road for O, that way madness lies!). My father however, knew no food boundaries (and still continues to be unaware of such) and would dip his hand into the sandwich bag many times on one trip. I would sit and hope that, when the proper amount of time since my last sandwich passed, and I reached for another, there would still be an egg salad left. There usually was, owing to my dad’s penchant for cheese pimiento, but it was always a dodgy moment, that second when I would rummage through those neat squares of white bread. – Chop the bacon and fry in a dry non-stick pan until crisp and golden. Drain cooked bacon on a plate lined with a paper towel (fold it into two for double thickness and extra oil-absorbency). – While the bacon is cooking, chop the hard boiled eggs into chunks, no need to be exact, and place in a bowl. – Add green/spring onion and dill to the bowl with the eggs. Add bacon (well drained of residual oil) and mayonnaise. – Sprinkle with salt and freshly cracked black pepper to taste. Toss gently (Gently now…the eggs will break, there’s no avoiding this, but you don’t want to pulverize them) to mix. Taste and adjust seasoning. – Store in a jar in the refrigerator. This egg salad is based on the egg salads of my childhood, perked up with some fresh herbs, and tailored to suit my love for bacon. Bacon and eggs go together so well don’t you think? 🙂 I like my eggs in not-too-small chunks and the mayonnaise to coat every piece…not too much but not too little either because, as horrible as this makes me sound, I love mayonnaise (trust me; I have tried to cure myself of this affliction to no avail). Pile onto a greens-lined slice of wheat bread…I love this with either arugula or alfalfa sprouts, but all I had was the romaine you see in the photo. i love love egg salad sandwiches – soeren has the same passion for them and we make sure to make some kind of variation once a week!!! i second mark on that – fresh is best! you know what, those are our road trip, picnic and family outing sandwiches too!! I love a good egg salad sandwich and can't wait to try your version (with bacon, yum!). So yummy looking! Perfect with dill and mayo! This is exactly what I'm in the mood for – I've been looking at tea sandwiches and other cute recipes, but its egg salad on rye bread with the curst cut off is exactly what I'm in the mood for! Yuumyyy 🙂 Definitely best breakfast pasta 🙂 must be delicious. Oh, I love egg salad but have never made it with bacon. I will now! Thanks for the recipe! I LOVE egg salad! And even more, I love egg salad sandwiches on whole grain bread. Good call on adding bacon!!! Also, dill = yum. What a perfect recipe! Hi Jo! Definitely nothing more delicious that egg salad sandwich with BACON! I loved your story today, reminds me of the times our family used to go to Bagiuo every Christmas and Summer and Mom would pack us little snacks along the way. It can't get any better: egg salad sandwiches, with bacon, eaten out of hand, on the road! Egg-salad sandwiches are ok though. I guess I am just weird when it comes to eggs. This is very timely… i mean since it's the lenten season, egg salad sandwich is a good baon sandwich for Fridays! An all time favorite. Must make my egg salad with bacon. Don't know why I have never thought of doing that before! I love love love egg sandwiches! This looks like a winner. Haven't tried it with bacon, dont care for bacon that much but willing to give it a try. Hi Manggy! Homemade sandwiches the best, I agree! I always tell my hubby “the best sandwiches are the ones you make yourself” 🙂 Cold and soggy sandwiches are definitely a downer! Hi Meeta! Fresh is definitely best 🙂 Glad to know there’s a couple of egg salad fans out there across the ocean! Thanks Rosa! Love the fresh dill! Hi Holly H! Turning this into a little tea sandwich would be lovely! Hi Irene! Yay! 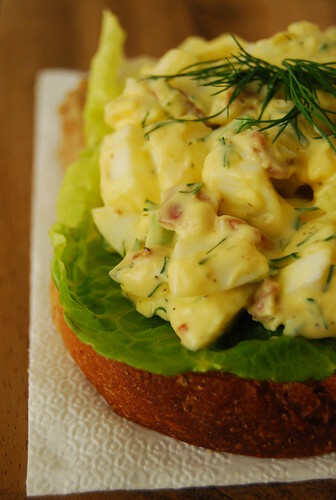 More egg salad lovers 🙂 Yes, I think bacon and dill here are splendid! Hi Baking Soda! Hope you like it! Hi Anh! Hehe…I am familiar with childhood food issues! I love eggs…I think I’m weird when it comes to mince! Hi Malou! Hmmm…true! Didn’t even realize that! Hi Sweet Tooth! Thanks! Don’t care for bacon?? Lucky you…it is my weakness and not exactly health food! I was the opposite when I was a kid, I hated my mother's egg salad sandwiches–I remember them being very bland. But now, I find that my wife makes the best egg salad sandwich and I love it whenever she makes them. She actually adds a bit of lemon juice to the egg salad, it might sound weird, but it's so good! I'll have to try and see if she'll put some bacon in it next time. What a lovely food memory! There's always eggs, bacon and mayo in my fridge. My fave low-carb snack is egg mayo with a hit of green onion – and I eat it very slowly, savouring every little bit. I have a struggling dill plant, must coax it to hang on so I can snip some for the next round of egg mayo! I love a good home made egg salad! And this looks definitely so good! Hi Ling! Oh hope your dill plant hangs on for this…love the flavor it gives to egg salad 🙂 Smoked salmon and chopped olives sound fantastic for an egg salad…must try that next time! I used to hate egg salad and even egg sandwiches but I love them now. And I agree with Mark, homemade sandwiches are better than Starbucks which costs a fortune. With a mom like you and a grandmother like your mom, I wouldn't be surprised if Little C becomes quite a foodie herself! Hi Anne! Japanese mayo is great as well…we also have a bottle in our fridge! Badon in the Egg Salad? Why didn't I think of that! That was always my favorite as a child, too. I couldn't stand the Peanut-butter and jelly most kids like! Now re: bacon. Well… it can't go wrong can it? Hi Katiez! Although I do like peanut butter and jelly (but with local guava jelly not grape jelly as is popular elsewhere), I always favored savory sandwiches like this 🙂 The bacon rocks it! I don't know how I have made it my whole life without trying egg salad but I have. I have only recently begun to like hardboiled eggs and I will definitely have to try this recipe. I especially love dill! I recently found your blog and I really enjoy your recipes! Hi Anna! Thanks for stopping by and leaving a nice comment 🙂 Hope you like this egg salad! I just made this! Perfect for a rainy Saturday afternoon and sooooo good. You would think that egg salad would be hard to screw up but I have made it so mediocre so many times in the past. This sandwich was a pleasure. I just linked to you from my site. Thanks aggain! edna and i were craving for egg salad sandwich the other day and this is just perfect – especially with the bacon! this is also one of my favorite childhood snacks with pan de sal and Zesto! i agree totally about mayonnaise. it's heaven on every bite! Hi Jam! This is so easy to make…and then you guys can just keep it in your fridge for anytime snacking…even midnight snacking! I love a good egg salad sandwich, and yours sounds especially delicious with the addition of bacon! yum! I so wanna try this! Every recipe you put up here is so mouth-watering that I found this easy and yummy recipe with bacon and eggs that it motivates me to try it! I gotta bring my brother with me for grocery of the ingredients. Hi Cat! Thanks for stopping by 🙂 A dash of paprika sounds great (owing also to the fact that I love paprika)…will try that next time!